George founded "George's Watersports" in September 2014. Originally, the business was focused on kayak tours, but as time went on, George moved into paddle board rentals and then boat tours. 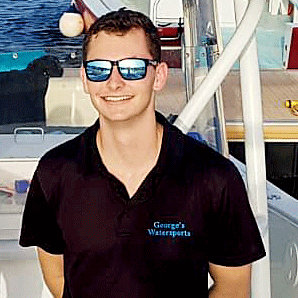 Having grown up in the Cayman Islands, George has been involved in watersports for many years, and is focused on providing the best possible experience to his customers. Our boat is fast and comfortable; it can take up to 12 guests and is ideal for friends and family looking for a fun day on the water. We charge $950 USD for a 5 hour private charter to all 5 stops above. $950 USD up to 9 people. Additional $75 usd per additional person if group size is above 9 people. Charter departs from the Cayman Islands Yacht Club, which is near Seven Mile Beach. If you are staying on the east side of Grand Cayman, then we can pick you up from "Kaibo" dock, which is near "Rum Point". Check Out Our TripAdvisor Reviews Below! Make sure that you don't make a mistake on the form, otherwise it won't send. We always respond within 24-hours; if you don't get a response, it's because the email didn't send due to a mistake made on the form. Our response can sometimes go into your junk folder. 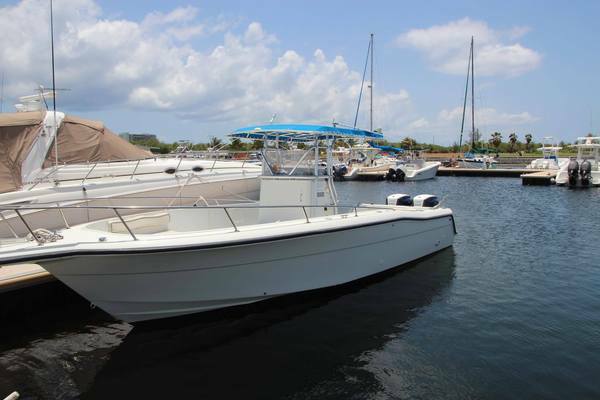 A private charter is the opportunity to hire a boat privately for yourself with your friends and family. Get a group of friends together or simply hire the boat for your own private needs and then let us know what exactly you want to do during your hire and we can make it happen. Our aim is to allow our guests to get the most out of their private charter and to experience everything which they wanted to experience during their vacation. As well as excellent customer service, we will provide unique insight on living in Grand Cayman and what it is like to live in the Caribbean. Our guides are friendly and experienced, thus making our charter service the perfect choice for you. The private charter includes: complimentary drinks, life vests, as well as pick up and drop off from your condo or hotel. Our free pick up service is unique on island. The charter departs from the Cayman Islands Yacht Club which is a short journey from Seven Mile Beach. All this allows us to be the most convenient charter on island. The main benefit is that you are able to have a more personal tour of Grand Cayman and escape the crowds. You may have a special urge to see or do something, which is not on the usual tour list or spend longer at a certain stop, and we can provide this. Therefore, a private charter is great value for money, especially as the boat is comfortable, clean and very well maintained. The classic itinerary for a typical private charter is to visit Stingray City, Starfish Point, Rum Point, snorkel at the barrier reef and visit the Mangrove Forest. Stingray City is one of the most popular attracts in the Cayman Islands. The sandbar where Stingray City is located is in North Sound, Grand Cayman. The water is 2-3 feet deep, which allows people to stand in the water and see the stingrays. Our charter company is a top tier operation. 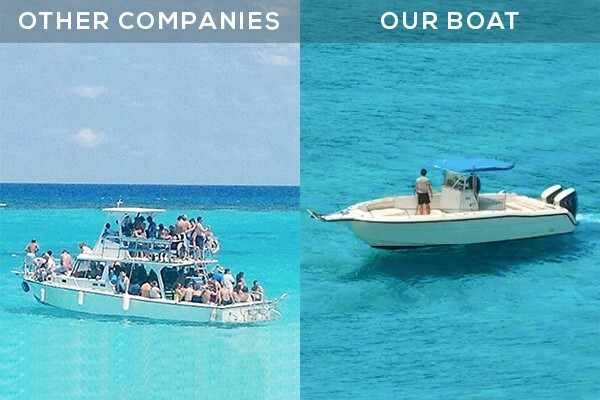 Other companies don't have the same quality boat that we have. 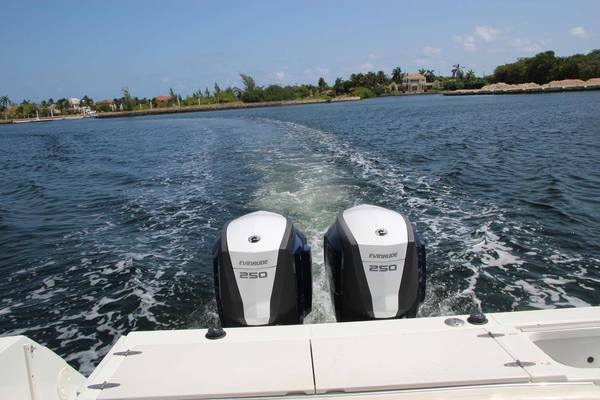 Our business also has the most experienced guides to make your boat rental the best possible experience. The water is a beautiful clear crystal blue, so you can see the stingrays easily from standing on the sand bar or from the boat. We offer the opportunity to hold and feed the stingrays. This is a fantastic opportunity to take amazing photographs with these magnificent creatures. The southern stingray is the species of stingray at the sand bar and they are very gentle, thus making it a safe experience. Starfish Point has the largest population of starfish on Grand Cayman, thus making it the perfect opportunity to see wild star fish during you visit to the island. The starfish slowly roam the isolated beach and live in the shallow water, making them easy to spot. It is possible during this stop to learn more about star fish and learn how to safely handle the animals. The starfish are a beautiful red and are sight for everyone’s Bucket List. For those who love snorkeling, our trips are the perfect opportunity to see many different species of beautiful tropical fish and coral. The bright colors of the fish and coral makes snorkeling in Grand Cayman one of the best in the wold. The snorkel spots are sheltered from the barrier reef, thus making North Sound a safe and easy place to snorkel. We can take you to private snorkeling areas away from the crowds of tourists, which will allow you to see the fish undisturbed in their natural habitats. Whilst on the water, you may get hungry and fancy trying some delicious local cuisine. We can take you to Rum Point, which is frequently featured as one of the most popular beach restaurants on Grand Cayman. This restaurant, situated on a beautiful white sand beach has a beautiful view of North South. This tranquil place has plenty of shade, hammocks and beach chairs to allow you to rest, while enjoying a delicious meal. This stop has food suitable for everyone, including children. It is an ideal stop for people who need a snack, somewhere to rest, or just simply want to see another part of the island. As well as eating, it is also possible to swim and snorkel at Rum Point. There is a clean restroom with fresh water, so you are able to wash off the salt from your skin. There is also a small souvenir store in case you would like to buy a memoir from the island. The Mangrove Forest is a fascinating stop where you can learn more about the essential role of mangrove forests in the Caribbean and the local ecosystem. Mangrove acts as a natural protection along the Grand Cayman coast line during strong storms. Mangroves are also where fish breed and live until they are old enough to survive in the open sea, therefore you may be lucky and see many young fish. You will see many birds and iguanas in the mangrove, which adds to the beauty of the forest.